Jaguar Land Rover has built the last Land Rover Defender at its Solihull plant, ending production of a vehicle that can trace its history back 68 years. 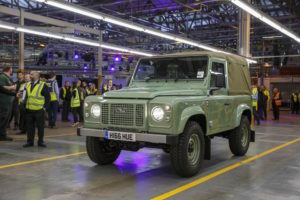 The company affirmed that it was looking ahead to designing and engineering a successor, New Defender. To mark the occasion Land Rover invited more than 700 current and former Solihull employees to see and drive some of the most important vehicles from the Defender’s history, including the first pre-production ‘Huey’ Series I, and the last vehicle off the production line, a Defender 90 Heritage Soft Top. The Defender Celebration in Solihull saw more than 25 vehicles from Land Rover’s history come together in a procession around the Solihull plant, featuring the final current Defender vehicle off the line, which includes an original part that has been used on Soft Top specifications since 1948 – the hood cleat. The vehicle will be housed in the Jaguar Land Rover Collection. 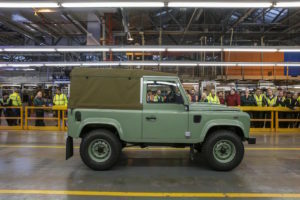 More than two million Series I, II and III Land Rovers and Defenders have been built in Solihull, UK since the car was first launched at the Amsterdam Motor Show in 1948. After the Series II and III models incorporated a number of refinements to the original design, the vehicle earned a new name in 1990 – Defender – in a range rounded out at that time with the range Rover and then-new Discovery. Over the years, endless variants were created off the basic platform, including models as diverse as fire engines, lorry-like Forward Control vehicles, cherry pickers and even an amphibious car capable of floating on water. Over its 68 year history, it has been a vehicle driven by everyone from farmers and explorers, to royalty. Famous owners include the Queen, Sir Winston Churchill and the actor Steve McQueen. As Defender production ends, Land Rover has also announced a new Heritage Restoration Programme, which will be based on the site of the existing Solihull production line. A team of experts, including some long-serving Defender employees, will oversee the restoration of a number of Series Land Rovers sourced from across the globe. The first vehicles will go on sale in July 2016. Land Rover has also announced the planned launch of its ‘Defender Journeys’ platform, an online hub that will allow owners to upload details of their most memorable journeys in a Series Land Rover or Defender.